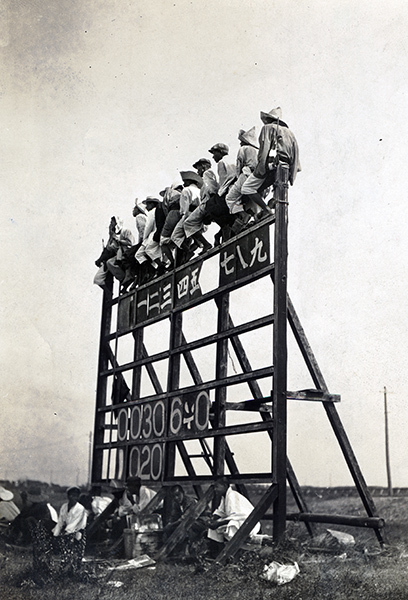 1922: Spectators perch at the top of a scoreboard to watch a game at Naruo Studium. Japan's rite of summer passage will mark its 100th anniversary when top high school baseball teams from across the nation descend on Hanshin Koshien Stadium in Nishinomiya, Hyogo Prefecture, next month. The National High School Baseball Championship, popularly known as Summer Koshien, dates back to 1915, when junior high school students under a prewar education system competed. It was not held for four years through 1945 due to war. A number of pictures taken by Asahi Shimbun photographers provide glimpses of the tournament from the 1920s to the 1950s, including the shadow of militarism and the clouds of war. The first championship was staged at the Toyonaka grounds in Osaka Prefecture. No TV or radio broadcasts existed, and spectators thronged around the baseball field to watch the games. The venue was moved to Naruo Stadium in today’s Nishinomiya from 1917. It was shifted to Hanshin Koshien Stadium, which was essentially built for the tournament, from 1924. The Second Sino-Japanese War broke out in 1937. In December 1941, Japan entered the Pacific War, which lasted until its surrender in August 1945. Propaganda banners were hung in the stadium during those years. Many of the former high school baseball players were sent to the war front. The 27th championship was discontinued in the midst of regional preliminary rounds in 1941. The first postwar championship was held at Hankyu Nishinomiya Stadium in 1946. Hanshin Koshien Stadium, which had been requisitioned by the U.S. military, finally hosted the championship again the following year.